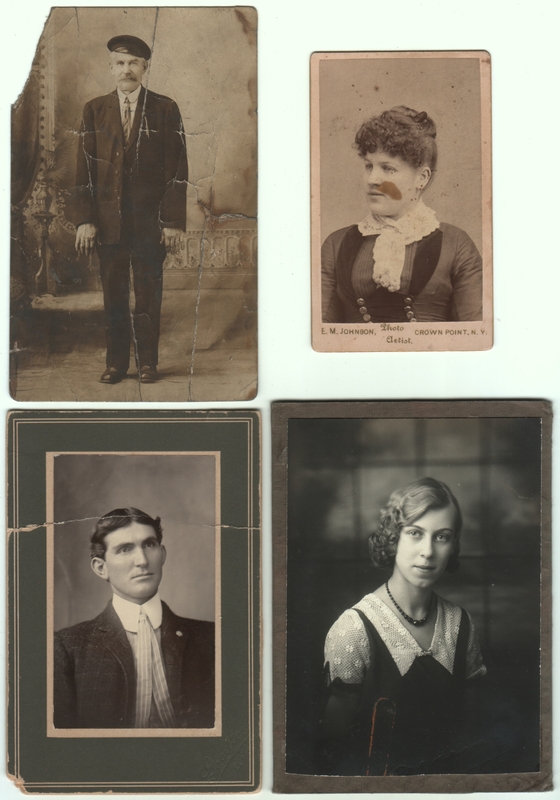 Four photos (including a CDV and a photo mounted into a folder, the flaps of which I folded back for this scan) measuring from 2.5 x 4 inches to 3.5 x 5 inches. Top right photographer is E. M. Johnson of Crown Point, New York. Bottom left photographer’s stamp is incomplete, but might be Goodloe of El Paso, Texas. Bottom right photographer is Calvert’s Studio of Oregon City, Oregon. Otherwise all undated and unidentified. Some years ago I read an article in a magazine (I think it was American Theatre, but I’m not sure) about the Costume Collection at the University of Missouri. It’s an archive of thousands of vintage clothing pieces, with a special emphasis on everyday clothing, but it’s also a working educational tool, allowing students of fashion and design (theatrical costuming students, in the case of that article) to have hands-on experience examining vintage clothing construction and trying their hands at copying patterns and techniques. One thing that’s always stuck with me about that article is the way the collection welcomes damaged clothing, since the lessons are the same regardless. One example it gave was a gorgeous 19th Century gown that was perfect in every way except that it had a large hole burned in it from being stored against a radiator. Such a gown would not be on display in the costume exhibits at the Met or the Victoria and Albert, but it was right at home in Missouri where it was put to use, not just displayed behind glass. That approach has somewhat informed my attitude toward my collection. I would sometimes buy large unsorted auction lots of old photos hoping for bargains, and while they usually included some inexpensive gems, they often included damaged items, such as the ones shown here (with everything from a shattered cardboard backing to a paperclip rust stain). But I love looking at old photos because I love looking into other people’s lives, particularly lives from a different time or place, wondering what life was like, and I can often do that with a damaged photo as easily as I can with a pristine one. So rather than discarding the ones above, I’ve kept them and enjoyed looking at them (the intriguing clothing! the beautiful lighting! those compelling faces!). Don’t get me wrong, I love beautiful photos in mint condition. I get excited when I see them posted on the blogs I follow and other places, and I aim for good condition when buying them for myself. But while I’m less inclined to post damaged photos on my blog, I have to admit I often love them just (or at least nearly) as much. A hands-on costume collection for learning purposes – what a wonderful concept! I agree! Doesn’t it make you want to go through it? To be clear, nobody is wearing the clothing, since it still needs to be handled carefully for preservation purposes. These pictures are great as a representative of the changes in fashion. Love the hat on the first gentleman! I agree with your comments on damaged photos, good for posting them.